This cheery Tutti Frutti Baby Blanket is a quick project that combines Tunisian crochet, entrelac, and lace, all in one. Make this cute little blanket for a baby shower gift. Enjoy! 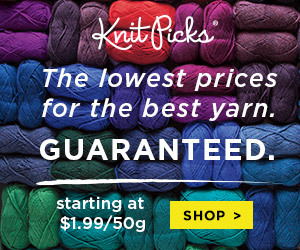 This blanket uses all of one skein and only a small amount of the second skein. It is worked in the round, using a technique commonly referred to as “Around the world entrelac”. If you follow that link, it will take you to my photo tutorial. This project uses an eyelet lace that is also called “Arrowhead Lace”, however, if you want you can work the squares in plain TSS. Foundation row: work standard forward pass, picking up loops on hook. Work standard return pass, working them off the hook. Row1: (Remember, you don’t work the first stitch!) “ Tss2tog, yo * repeat across to last stitch, TSS in last stitch. 20 loops on hook. Work standard return pass: YO, pull through one loop, YO, pull through two loops across. Row2: * TFS in eyelet hole below, TSS in vertical bar below, * repeat across to last stitch, TSS in last stitch. Work standard return pass. Repeat these two rows for pattern. Last row of each square will be a Row2. You will bind off in pattern. Round One (Central square): Following the tutorial linked above, chain 20 and work a central square of 20 stitches and 20 rows. Work standard return pass on this square: Bind off. Round Two (Four corners): Following the tutorial, attach yarn to one corner and chain 20. Work in Arrowhead Lace pattern, joining each row of this new square to the corresponding row of the central square. Work all return rows: YO, pull through 2 loops across. Cut yarn. Round Four: (Inverted triangles) If you’ve never done these before, have a look at my Mandala tutorial, which incorporates inverted triangles to round out a circle. In this case we will be using them to straighten the edge of the blanket. The inverted triangles are worked in the same style as the entrelac squares. The difference is that you will skip the next stitch of each row, thus decreasing by one stitch. Row 1: work a regular foundation row as established. 20 loops on hook. Work return row: YO, pull through 2 loops across as previously established. Row 2: Skip the second vertical bar. Begin Arrowhead Lace. 19 loops on hook. Draw up an extra loop in square to join. Work return row as instructed above. Row 3: Skip the second vertical bar. Work in Arrowhead Lace to end of row. 18 loops on hook. Draw up an extra loop in square to join. Work return row as instructed above. Continue like this, decreasing one stitch at the beginning of each row. Switch to plain TSS when there are only three stitches left to work. Trim: Using a standard hook, attach yarn to any corner. In each corner work a V-stitch: (dc, chain 3, dc). In all other stitches work dc. Next round: V-stitch in V-stitch, dc in dc around. I worked two rounds, you can work as many rounds as you like. Weave in ends and block. Blanket will be a little lumpy. Blocking will help to open up the lace. I was trying to find the tutti frutti baby blanket pattern but I can’t get the link to work. Is it me or is the pattern no longer available. The link is working now. Let me know if you have any issues. Bad Behavior has blocked 3602 access attempts in the last 7 days.